Alleged murderer Troy Harper James (left) is led into a Marion County courtroom for his preliminary hearing on Thursday, Aug. 18, by Marion County jailer Cody Watson. HAMILTON - A Brilliant man will now stand trial for his alleged role in the murder of his wife in late June after Marion County Circuit Court Judge John Bentley forwarded the case to a grand jury. 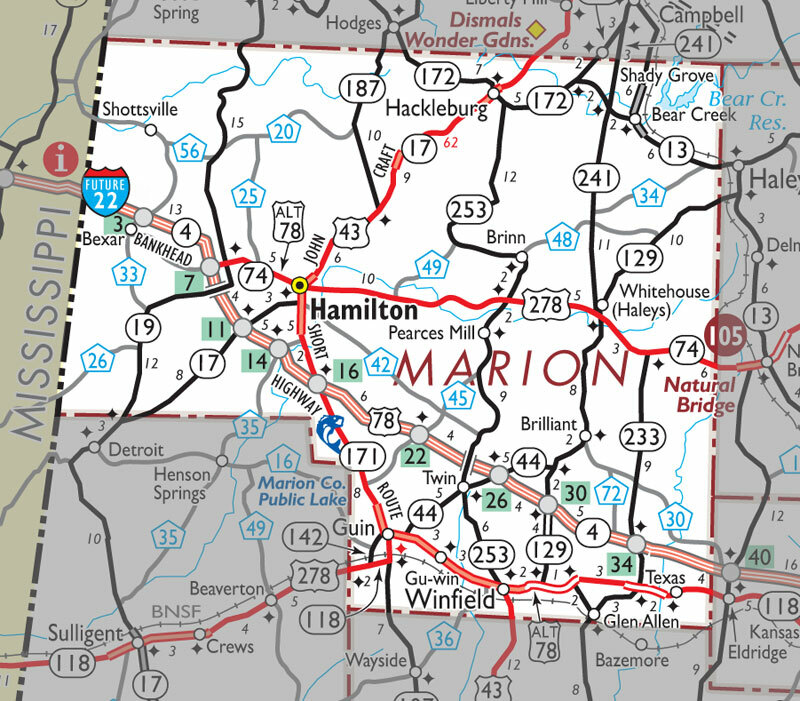 The judge’s decision was handed down following a preliminary hearing, which lasted almost two hours at the Marion County Courthouse in Hamilton on Thursday, Aug. 18. Troy Harper James, 38, was charged in the murder of his wife, Tracy Lynn Fortham, 41, Brilliant, after her body was found inside the couple’s burning home on June 23. The couple had been married for about a year, according to authorities at the time of her death. The incident occurred at the couple’s home located at 915 Main Street in Brilliant, just a short distance from the Brilliant Police Department. James is being held at the Marion County Jail in Hamilton without bond for the duration of the trial. The preliminary hearing marked his second appearance in a county courtroom, as the first came less than 24 hours after his wife’s death. Two witnesses were called in the hearing--Brilliant Police Department Investigator Kevin Bryant, who remained on the stand for 70 minutes, and Marion County Sheriff’s Department Deputy Bill Pendley, who was questioned by Marion County District Attorney Jack Bostick and defense attorney Jim Standridge of Tuscaloosa for only 18 minutes. Serving as co-counsel in the case is Hamilton attorney Jeremy Streetman, as each was assigned to the case after James noted in his first hearing he could not afford legal counsel. In his testimony, Bryant said Fortham’s body had been discovered by local emergency personnel only after efforts had been made to distinguish the blaze. Pendley later testified the entire house had been “saturated’’ with water by the time police and firefighters on the scene realized a body was lying on the floor of a back bedroom. The officers testified the decision was made to remove Fortham’s remains before any further investigation in the bedroom could be conducted due to fear the blaze could eventually cause the structure to fall and further damage the body. Bryant said the body was removed from the home and placed on the ground behind a firetruck at the scene. Multiple photos were taken of the remains, as well as a number of the other areas around and inside the remains of the house. The Brilliant investigator said a local resident named Lee Bob Baker arrived at the home shortly before the fire began to inform the couple they were being ordered by the property owners to vacate the premises by the end of the month, which was seven days later. Baker would later tell the investigator that the couple was four months behind on their rent. Bryant testified that Baker would later tell investigators that the exchange with James had occurred about “15 or 20 minutes’’ prior to the time the residential fire is believed to have started. Baker said he was a friend of the homeowners, who live in Tennessee, and had been asked to deliver the verbal eviction notice to the couple. Bryant said Baker had noted there had been no confrontation with James as the notice was delivered. Surveillance video from the police station camera just down the street shows where Baker pulled into the home’s driveway at 9:03 p.m. before pulling away two minutes later. However, Bryant said that James appeared to be “very agitated’’ at the time he arrived at the scene to deliver the eviction. Baker later told investigators that James pulled away from the home shortly after the two men had spoken. James returned to the scene after 11 p.m. in the company of his aunt and uncle who live nearby, said Bryant, who added the suspect claimed to have visited with his relatives for a drink. The investigator said surveillance video from a convenience store in Winfield confirmed James had been inside the store to purchase alcohol. Bryant said James had been administered a breathalyzer test at the scene, at which time the suspect blew a blood-alcohol reading of 0.053, which is below the 0.08 level deemed as legally intoxicated in the State of Alabama. The investigator said there were also no signs James was under the influence of any other controlled substance. Returning to the scene with his relatives, James was told about his wife’s death and was seated in a nearby patrol car to “gather himself,’’ said Bryant, who said James had asked authorities if his wife had survived the blaze. In time, James was carried to the Brilliant Police Station for further questioning. This interview was recorded using a body camera, according to Bryant. In this interview, Bryant said James’ story began to show signs of conflict. He said the time line offered by the suspect was not consistent with his earlier comments or those offered by Baker and another patrol officer, who first witnessed smoke coming from the rear of the home at 9:28 p.m.
Crews remained at the scene until after 3 a.m. the following morning. According to Bryant, Baker recounted seeing the suspect run from the home only to toss an item into an outside waste can. Officers would later discover a partially-empty hair spray can, which is now believed to have been used as an accelerant in starting the blaze. However, the testimony given later in the hearing by Pendley said no evidence of hair spray had been found in forensic testing on clothing belonging to the victim or the suspect. Pendley said there had been no evidence to suggest James had changed clothes from the time he first left his home before returning to find the blaze and learn of his wife’s death. Bryant also testified that a search of James’ vehicle, which had been left at his relatives’ home, resulted in the discovery of several important documents, including his birth certificate and military discharge papers. The officer recounted the various departments at the scene, including police and fire crews from neighboring communities. Questioning from the defense attorney required Bryant to individually list the names of the firefighters at the house. He referred to a list he had brought into the courtroom as part of an assortment of documents compiled over the course of the investigation. Departments which helped battle the blaze included Twin, Brilliant, Pea Ridge and Winfield, according to Bryant. The preliminary medical report cited by Pendley said Fortham died from blunt force trauma to the chest and strangulation. The report did not cite burns as a cause of death, indicating the blaze burned the victim’s body postmortem. Bryant testified that the victim suffered severe burns primarily to her upper body. There were remnant of shorts still visible on her lower body, but no clothing of any kind worn on the upper body other than some form of clothing which appeared to have been wrapped around her head, according to the deputy. Fortham’s body was found lying face up, said Pendley, who said it appeared that it was this clothing on her head which was used to start the fire. Damage to the bedroom floor of the home was cited in the investigation with the deputy saying it appeared the blaze spread across the floor and up a nearby interior wall before reaching the attic. Each officer testified that representatives from the state fire marshal’s office were at the scene the night of the blaze. In an interview with the Journal Record shortly after Fortham’s death, Bryant said James had no known prior criminal history and had moved to the area shortly before the couple married. Near the end of the hearing in June, Bentley said the incident would be tried as a capital murder case, meaning the suspect could face life in prison without parole or the death penalty, if convicted.